KIEV, Ukraine -- Ukraine Prime Minister Yatseniuk on Monday, said Russia is "on the dark side," blaming it again for the downing of Malaysia Airlines Flight 17 and demanding that it close its Western border to halt separatist activity in eastern Ukraine. 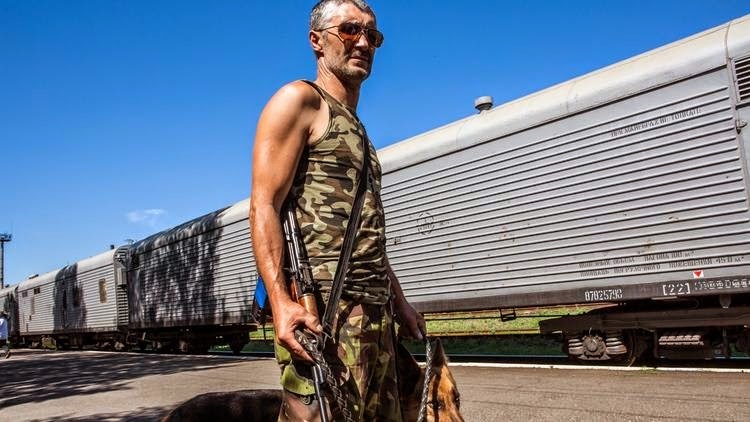 A Russian separatist in Torez, Ukraine, guards train cars containing bodies from the downed Malaysian Airlines jet. Russia "trained these bastards and supported them and even orchestrated ‎this despicable crime," Yatseniuk said of the missile strike that brought down the jetliner in which pro-Russia separatists are suspected. Asked if Ukraine was pushing Germany and other European nations to lean more heavily on Russia to call off pro-Russia separatist activity in eastern Ukraine -- an effort most experts believe will have the most tangible effect on the conflict -- Yatseniuk didn't single out efforts in Western Europe and instead said‎, "This is a global threat and Russia is on the dark side. This is our priority and [should be] the key priority of the entire world -- to stop Russian aggression." The remarks, made to reporters at a Kiev news conference, underlined the growing intensity of the showdown between Russia and Ukraine -- as well as much of the global community -- spurred by the crash of Flight 17. They came after Putin made comments seemingly directed at Ukraine in a video statement overnight, in which he expressed regret for the tragedy but also made veiled a reference to rhetoric from Kiev. "No one should and no one has the right to use this tragedy to pursue their own political goals," Putin said. "All those who are responsible for the situation in the region must take the greatest responsibility before their own people and before the peoples of the countries whose citizens were killed in this disaster.‎"
The Kremlin denies that it has provided any assistance to pro-Russia separatists who are suspected of bringing down the plane, and instead has pointed to the fact that Ukraine has surface-to-air missile capability. Ukraine feels it has global momentum on its ‎side in its fight against pro-Russia separatists in eastern Ukraine, particularly as outrage grows over the separatists' handling of the post-crash effort and Russia's‎ involvement with the paramilitary groups. On Sunday, U.S. Secretary of State John F. Kerry and British Prime Minister‎ David Cameron pointed fingers at the Kremlin, accusing it of complicity with the separatists. Cameron said that Russia was "destabilizing a sovereign state" and called on Western Europe to exert more pressure on Moscow. They also underlined ‎Russia's involvement in training and equipping separatists whom they strongly believe fired the missile that downed the jetliner. In Kiev, ‎Yatseniuk repeated that belief, using his characteristically harsh language in saying that operation of the weapon required veteran military expertise. "Any Russian drunken guerrilla cannot manage this system‎," he said. Meanwhile, Ukraine and pro-Russia separatists led by Alexander Borodai continue to wage battle in the eastern part of the country. On Monday, fighting intensified in and around the urban rebel stronghold of Donetsk. Ukrainian National Security and Defense Council spokesman Andriy Lysenko said Monday afternoon that the government was widening control around the all-important airport site but that separatists still held the city. He also said the Ukrainian military believed that there was an "escalation" of Russian Federation forces on the other side of the border, with "100 new pieces of heavy machinery on the border of Ukraine." The fighting jeopardized the post-crash efforts in the region. More than 250 bodies from the downed jet are now waiting in a train station in Torez, about 40 miles east of the Donetsk, but they appear to be caught in ‎a political tug-of-war between Ukraine and the pro-Russia separatists with little imminent solution. Putin also called for the post-crash efforts to move forward with an international investigation ‎and a cease-fire in the hostilities between Ukraine and the separatists. "Russia will do everything within its power to move the conflict from the military phase we see today to the negotiating phase, with the parties using peaceful and diplomatic means alone," the Russian leader said. Yatseniuk blamed Russia for not doing more to call off separatist military activity around the sensitive area. "‎The Russian government has done nothing in order to provide an opportunity for law enforcement and security bodies to have unhindered access," he said.